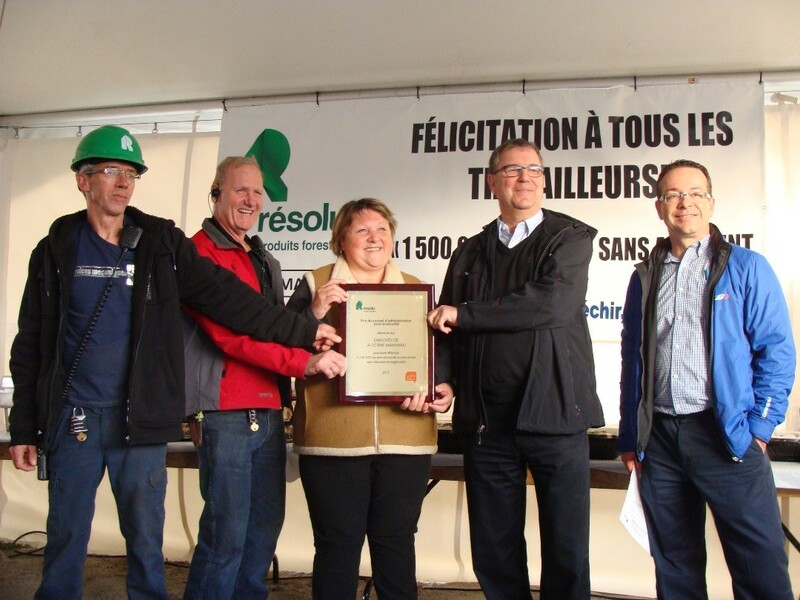 Steeve Klucaric, manager of HR and Health and Safety at our Maniwaki sawmill, which recently celebrated an impressive 1.5 million incident-free hours over nine years, says it’s all about the right mindset. “Getting hurt is just not an option,” he explains. “We don’t think in terms of what if I get hurt,” adds François Richard, prevention representative, “instead, we ask ‘what’s the safest way to do this?’, and that’s what we do.” François has 19 years without an accident and his colleague and saw operator Francine Lacroix holds an even longer 22-year injury-free record. It’s a different way of thinking about safety that Francine recalls discussing with Mill Manager Paul Grondin. In 2006, before implementing his new vision for a safety mindset, he would often meet with Francine, who was a member of the health and safety committee, to discuss the idea. “At the time, I didn’t think it would make a big difference,” she admits. But her skepticism faded when week after week the sawmill was incident free. Within a year, Maniwaki was celebrating its first 250,000 hours without an incident and Francine was converted. TALK ABOUT IT. Regular Monday safety meetings before the morning and afternoon shifts give everyone a chance to hear about issues and voice concerns. But supervisors are also very present on the work floor and spend much time making sure everyone is communicating, because a lack of communication is a leading cause of accidents. DON’T FALL COMPLACENT TO A ROUTINE. Maniwaki employees are careful to remain focused on the task at hand, and consider all the safety aspects of each part of their job before taking action. KEEP TOOLS IN TOP SHAPE. Tools that are worn down and past their prime and blades that are no longer sharp are quickly replaced. Working with sub-par tools can lead to incidents or accidents. KEEP A CLEAN WORK SPACE. Maniwaki has a great cleaning team, but keeping a clean workspace starts with each employee. Broken machinery and other possible hazards are quickly removed from work areas and disposed of responsibly. Ensuring a workspace has nothing on the ground eliminates sources of danger. 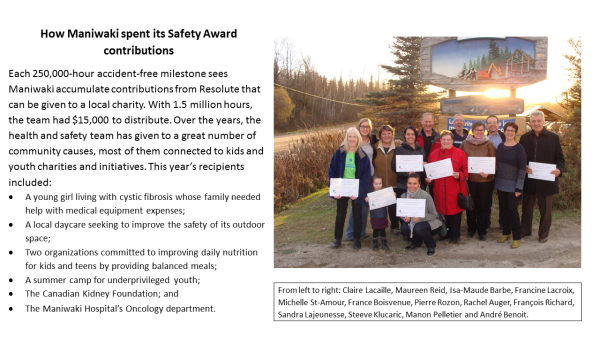 THINK ‘NEAR MISSES.’ The Maniwaki team reports on near misses and even possible near misses in a proactive campaign that sees any concerns voiced directly to supervisors. A status report on all near misses and possible near misses is updated daily and posted in the lunch room for everyone to see. Possible problems are identified and often addressed the same day. In fact, if it takes longer than 24 hours, an area with a near miss issue is cordoned off until it is resolved. REPEAT. Safety talk at Maniwaki centres around three risks: lack of communication, falling into a routine and taking short cuts. Employees are reminded of these dangers at every health and safety meeting.